Gaging fixtures are a staple in many metrology labs and assembly lines. They offer a fast, easy, and inexpensive way to determine if a measured part passes tolerances. Two popular tools that are found in many fixtures are HEIDENHAIN length gages and Linear Variable Differential Transformers (LVDT). While LVDTs and HEIDENHAIN length gages are both used for the same purpose, the way they operate is fundamentally different. LVDTs operate using an inductive scanning principle. Faraday’s law of induction states that voltage is induced in a circuit by a change in magnetic flux passing through the circuit. For a coiled wire, this relationship is proportional to the number of loops in the coil. A LVDT consists of a primary coil and two secondary coils with a ferromagnetic core in the center. Alternating voltage is supplied to the primary coil which generates a magnetic field. This magnetic field generates a magnetic flux which depends on the magnetic resistance of the coils and the position of the core. Depending on the position of the core, the magnetic flux between the primary and secondary coils changes, and thus also the induced voltage. The secondary coils are 180 degrees out of phase with respect to the center so the output of the LVDT is the difference between the individual voltages of the secondary coils and zero at the center. Small variations in the position of the core will lead to different output voltages which can be related to different position values. Because different voltage levels relate to different position values, the output of a LVDT is absolute. On start up the LVDT will know its absolute position value. HEIDENHAIN length gages, on the other hand, operate using an optical scanning principle. Located inside each length gage is a small standard of known length made out of glass or glass ceramic. This standard is lined with precise metal graduations at known increments. Light is shown through a reticle which has an identical graduation and then through the measuring standard to a photodiode. As the measuring standard moves, the graduations of the standard begin to overlap with the graduations of the reticle partially blocking the light that reaches the photodiode. Eventually, based on the movement of the standard, light is fully blocked and then revealed depending on the overlap between the gratings of the reticle and standard. The photodiode converts this change in light level into a sinusoidal output signal where the period is a known value determined by the physical grating of the standard. A reference mark must be passed or a datum set so that a starting point can be determined before measuring. This scanning method, along with the precise quality of the glass standard and steel graduations allows for highly accurate readings at very small measuring steps. Because the measurements are based on a precise, physical standard, HEIDENHAIN length gages are very resistant to vibration and shock, and have a defined thermal behavior. Changes in atmospheric pressure or relative humidity have no influence on the accuracy of the measuring standard. Additionally, the standard is scanned with light and fixtured so that there is no physical contact allowing the length gage to function without wear. This fundamental difference in technology between LVDTs and length gages leads to several operating differences. Because a length gage is based on a physical standard, the output of a length gage is an actual distance that can be declared with the same confidence as the physical standard. The output of a LVDT on the other hand, is a voltage level that must be taught to a distance. This is done through a min/max mastering process to associate two different distances to two voltage levels. The control or readout the LVDT is attached to must then be able to extrapolate the other distances based on this min/max master. Additionally, because LVDTs rely on induction, the output voltage is not linear across the whole travel. 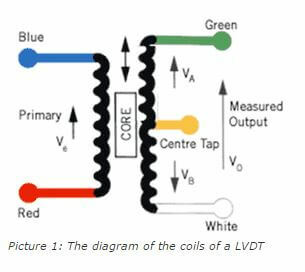 LVDT manufacturers try to make the secondary coils as tightly wound as possible in order to increase the distance where the output is linear but the very extremes will always be nonlinear and thus unusable. Perhaps the biggest difference is the LVDT’s need for recalibration. Changes in temperature will change the resistance of the wires. This in turn will change the output voltage creating a scaling error and requiring the LVDT to be recalibrated. Even simple operation of the LVDT will heat up the coils as voltage is generated along the windings. Length gages derive their measured values from a physical standard and thus no recalibration or maintenance is required. The accuracy of a length gage is also set over the entire measuring length whereas the accuracy of a LVDT is dependent on the travel. Another difference between LVDTs and length gages is that LVDTs are absolute while length gages require referencing. Upon startup, LVDTs already knows the absolute position on of the probe. Length gages require the user to move past a specially marked reference mark to determine a repeatable starting position. After that, the length gage can start counting based on the incremental gratings. New length gages get around this restriction by replacing the incremental gratings with a coded grating. This way, each position on the standard is represented by a unique code and the absolute position will be known upon startup. Many of the LVDT’s concerns can be satisfied by having a stable environment and by performing frequent recalibrations. Length gages are much more accurate, especially across a larger travel. LVDTs on the other hand are much more compact. Both devices have their pros and cons and proper consideration should be given to all aspects when the next decision on what type of measurement device to use arises. In some cases, LVDTs are the answer while in others, a more physical based measuring device would be better.